Trying to make sense of the almost-fatal stabbing in Waukesha, Wisconsin. What happened in Waukesha, Wis.? According to prosecutors, on Saturday morning, May 31, Morgan E. Geyser and Anissa E. Weier, both 12 from southeastern Wisconsin, stabbed their 12-year-old friend 19 times. The two girls had invited their friend over for a sleepover on Friday night and then allegedly lured her into the woods the next day and began their attack. According to reports, one girl pushed the victim down and sat on her. The girls then traded the knife back and forth between them before one of them finally tackled the victim and began stabbing her. The girls told police that they planned the attack for months. One of the girls told detectives that they were trying to become "proxies" of Slender Man, a monster they claimed could speak to them telepathically. Police say the girls, following the attack, were planning on hiding in a nearby abandoned house where they believed Slender Man lived. Geyser and Weier have been charged as adults and are being held on $500,000 bail each. If convicted each faces 60 years in prison. On Saturday, June 7, the victim was released from the hospital. "While we have kept discussions about the events of May 31, 2014, with her short, we did ask how she found the strength to crawl out of the woods," her parents said. "Her response was simple: 'I wanted to live.'" A passing cyclist called 911 after finding the victim lying on the sidewalk, where she had crawled from the woods. The victim had knife wounds all over her arms, legs, and torso. During the attack, the girls only missed a major artery near their friend's heart by a millimeter, according to reports. The victim was reportedly in fair condition after being treated in the hospital. "As our daughter is so young, we ask that you honor her anonymity and our family's privacy as we continue to heal and find our strength," the parents said in a statement. 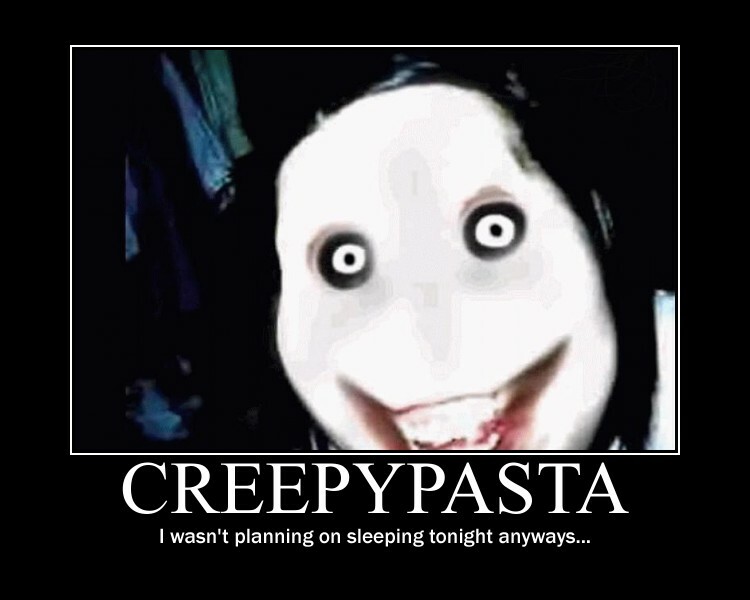 Creepypasta is a play on the term copypasta, which is internet slang for any block of text that's been copied and pasted all over the internet. Creepypasta describes things like creepy forwarded chain letters, eerie found photos, and other digital urban legends. Large message boards in the mid-2000s used to hold competitions to make the creepiest stuff. Before their attack, Geyer and Weier were reading a popular creepypasta Wiki, which has a lengthy section of Slender Man fan fiction. One of those creepypasta competitions produced a monster called the Slender Man. The Slender Man is probably the most popular modern urban myth. He's like an online boogeyman that is usually photoshopped into the back of old images. The accompanying text typically explains that all the children in the photo disappeared after the photo was taken. The Slender Man is often described as a tall faceless black-and-white figure, sometimes with tentacles, who can make people who see him go crazy and lose their memory. Where did the Slender Man come from? After the stabbing in Waukesha, both Knudsen and Something Awful have issued statements. Knudsen told reporters he was saddened to hear about what happened. Something Awful writer Zack Parsons said the girls were "dumb as hell." How popular is the Slender Man? The Slender Man has spread pretty far since 2009. It's regularly cosplayed at comic and anime conventions. It's spawned a handful of video games and thousands of YouTube videos. The urban legend of Slender Man has also morphed and changed since then. Slender Man's design and general vibe were most likely borrowed heavily from the Doctor Who villain, The Silence, which didn't appear on the show until 2011. The Silence are characterized as creepy, almost-faceless aliens who make people who see them lose their memories. Others cite the villains from a 1999 episode of Buffy the Vampire Slayer, known as The Gentlemen, as inspirations for the meme. The Gentlemen were silent, bald apparitions who wore suits and ties very similar to the wardrobe associated with Slender Man. One of the most formative Slender Man-based works was Marble Hornets. It's a sprawling YouTube channel of fake found-footage that tells the story of a young filmmaker who encounters a Slender Man-like monster and then goes mad because of it. "It's a really unfortunate event and our thoughts are with the victim," Marble Hornets creator Troy Wagner told BuzzFeed of the stabbing in Wisconsin. There will be a feature film based on the series. James Moran, director of Paranormal Activity is attached to the film. Both Moran and the film's production company Mosaic declined to comment. The mental health of the two girls who carried out the attack in Waukesha, Wis., has been called into question. An attorney for one of the suspects has requested the court to move her from juvenile detention to a mental health facility. The suspects told detectives that they were unable to feel remorse for what they've done. It's okay to obsess about Slender Man. Well, maybe not "okay" but it's normal. Internet normal. Okay, it's bad, but so long as you're not hurting anyone, it can be tolerated. We don't want your fandom's blood on our hands.